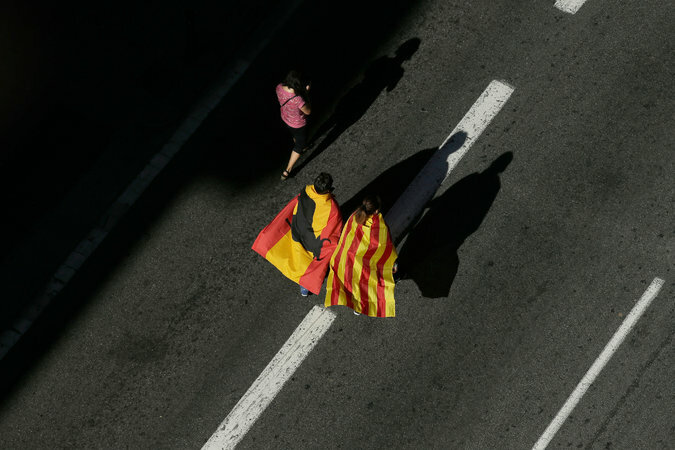 BARCELONA, Spain — Catalonia’s silent supporters of Spanish unity found their voice on Sunday, thronging into the center of Barcelona as part of a huge rally that reverberated with chants in support of a united Spanish state and against agitators for independence. They demonstrated solidarity with the vilified national police and proudly waved a red-and-yellow national flag that for decades had carried the stigma of a taboo nationalism. The separatist push has brought about one of Spain’s worst constitutional crises since the end of the Franco dictatorship nearly 43 years ago. Prime Minister Mariano Rajoy echoed that sentiment in an interview with the Spanish newspaper El País published late Saturday, in which he said flatly that the secession of Catalonia “won’t happen” and that he was “not ruling out anything” to maintain Spain’s integrity, including a constitutional article that allows him to disband the regional leadership and assume its powers. “We are talking about our nation’s unity,” he said. Mr. Puigdemont is expected to address the regional Parliament on Tuesday, when Catalan leaders could declare independence, citing the results of a referendum that the national government and the courts had said was illegal and ordered suspended. The rally on Sunday was organized to show that the referendum, which attracted international attention for a police crackdown that left hundreds injured, did not represent all Catalans. They are, in fact, deeply split over independence. Drivers flying Spanish flags from their windows blasted staccato beeps of their horns in support of people wearing Spanish flags over their shoulders like capes. 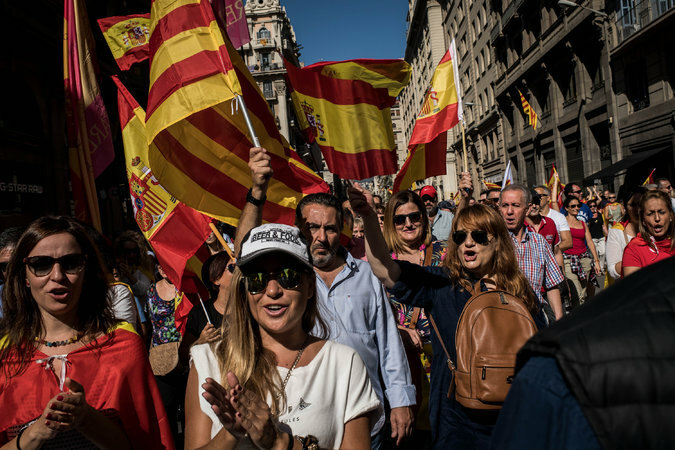 As helicopters hovered overhead, a river of supporters of Spanish unity snaked from Urquinaona Square down Via Laietana and past the city’s cathedral to its historic train station, where politicians read manifestoes in favor of a united Spain. Along the way, thousands chanted, “Long Live Spain, Long Live Catalonia,” “I am Spanish, I am Spanish,” and “Puigdemont to Prison.” They waved Spanish, Catalan and European Union flags and wore stickers of all three on their chests. The rally — estimated by the police at 350,000 people, though organizers said it was twice that — also served as a coming-out party of sorts for the national flag, which for decades has carried a stigma associated with the far-right groups nostalgic for the Franco dictatorship. Mr. Rajoy, in his interview, also suggested that the time had come for the flag’s stigma to be lifted. As she approached a Spanish flag carpeting the street in front of a paella restaurant, she said that it looked as if Spain’s soccer team had won the World Cup. 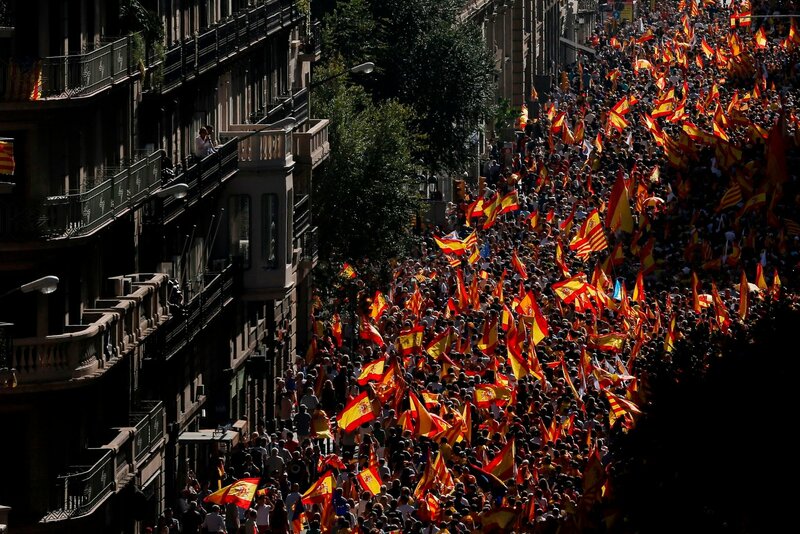 As demonstrators jeered at balconies hanging pro-independence flags, organizers and security forces cleared paths for politicians and celebrity supporters of Spanish unity who had lined up at the front of the rally. “I feel very enthusiastic and optimistic,” said Mario Vargas Llosa, the Nobel Prize-winning author who became a Spanish citizen in the 1990s and has spoken out in favor of conservative Spanish causes. Until now, supporters of independence have been the most vocal, especially after the violence on the day of the referendum gave momentum to their cause. 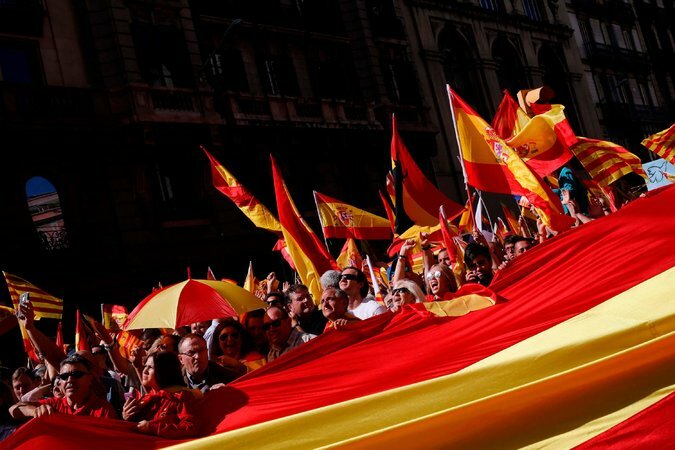 Supports of Spanish unity complained that the regional police force, the Mossos D’Esquadra, appeared to refuse a national order to block the referendum. Supporters of independence had thrown flowers at their feet, but the demonstrators on Sunday cursed their name. The Catalan police force — the leader of which is facing sedition charges in Madrid — was almost nowhere to be seen along the rally’s route. In front of the seat of the regional government, Manuel Perales Álvarez, a 54-year-old garbage collector, shouted at the stone-face Mossos officers standing guard. Lucas Fernández, 66, from Barcelona, stood next to him, holding a Spanish flag and yelling, “Long live Spain” toward Mr. Puigdemont’s office. Follow Jason Horowitz and Patrick Kingsley on Twitter: @jasondhorowitz and @patrickkingsley. Marta Arias and Germán Aranda contributed reporting.